Two Bears Farm and the Three Cubs: Zip and Zim - Two Bloggers Vs. Their Horses - Who's Smarter? 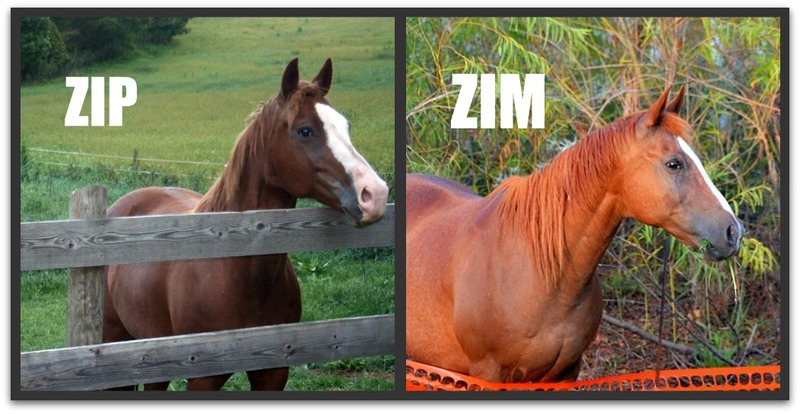 Zip and Zim - Two Bloggers Vs. Their Horses - Who's Smarter? This summer I was entertained and sympathetic when reading TexWisGirl's ongoing battle with her horse, Zim. As the Texas drought threatened her borders, Zim found new methods of escape. And she found new methods of restraints with some orange webbed fencing. We have our own escape artist here, Zip, who works hard to try to pull his own Houdini stunts. Do you see the resemblance? I think they're trying to outdo one another. In fact, I think Zip heard through the quarterhorse grapevine about Zim's finagling fence ways. And he decided to show off. By learning how to use his teeth to lift the hand grip from the electric fence and open it without shocking himself. Either that, or someone has been letting out our horses. Can you imagine what Zip and Zim could accomplish, if the two of them ever met face to face? Lucky for me (and TexWisGirl), they've got over a thousand miles of distance between them. Otherwise, pretty sure they'd be on their own episode of Sorrels Gone Wild. Please go visit Run-A-Round Ranch if you haven't and say hi to TexWisGirl. She was very kind to let me borrow her beautiful photo of Zim for this post! If you love horses, or know someone who does, be sure to go enter my giveaway for Alison Hart's newest Horse Diaries book here! This post linked to Farm Friend Friday. Such beautiful horses! It is really amazing how similar they are in looks and mindsets. Great post. I would love to read an adventure you could write about them. good to know I'm not the only technology dunce :) yeah I saw that I was already tweeting someone else's stuff. Hope I don't end up disliking these people I promote eek! Very beautiful horses. Hmmmm you named him Zip and she named hers Zim. I do see a resemblance, even in the names. Going over now to visit TexWisGirl. Such pretty horses! I remember those posts from T. What a summer she had trying to win the fence war! Yep, it's a good thing they're miles apart. Much less horsey mayhem that way! Beautiful horses! Yep they have to be related! Awww. They're both such beautiful horses, I guess that's one reason those boys can get away with getting out. Such handsome guys..and I'm glad of the miles between them! Ha, definitely a gold star for a horse that escape the electric fence. Fun stuff Lisa. And thanks for your comment over at my place the other day. I had to laugh about another parent having to sing verse after verse of Old McDonald while on a hike--you do get really creative with animals after 15 minutes. And here I thought runaway DOGS were a pain in the neck--I cannot even imagine a runaway HORSE. Good grief! SO beautiful... so crafty, just like kids. OMG! I think Zip wins for most ingenious escape artist! Undoing the handgrip of the electric fence? Now that's too smart for his own good!!! Good thing they're both pretty boys!!! Love the horsey comparison. They are both beautiful and wow, they do have very similar markings. These are two beautiful horses. I am impressed at how well they are cared for. They are magnificent. Maybe it's because both of their names begin with a "Z" --that makes them mischievous... BUT--that can't be right since I have another blog friend, Misha, who has a horse Annie --who broke their fence and escaped!!!! Oh Well..
Well, these horses are not only beautiful, but smart!! Hard to believe he could open that gate with his teeth, too bad you can't put a video camera out there and catch him in the act, wouldn't that make a wonderful addition to your blog and YouTube? Oh yes, those two would be terrible stinkers if they were in the same place. double trouble for sure!! they are both beautiful and smart!! i adore theresa, she is one wonderful woman!! Any good Kentucky girl worth her salt loves horses!!!! And, any good Kentucky girl knows how smart they are!!! I think you need to put a camera up, kind of like they do at beach condos so you can see the ocean at any time? That would be awesome! Then you could really see how they're doing it! Seriously? The horse is doing that? Great post - but don't let those two get together. They could take over the world! It is a really good thing those escape artist aren't in the same fenced in area because they wouldn't be fenced in for too long that's for sure! Both Zip and Zim are just gorgeous! Zip and Zim are beautiful horses and smart too. Imagine what would happen if the two of them got together and had time to scheme. Are those horses beautiful or what? These two characters will certainly continue to keep the people in their life on their toes! At least they keep things interesting! I visit the TX ranch every day, for every post and have very much enjoyed the houdini horse. and now there are TWO, would love to see what they could do together. buy lots of bird seed. LOL.. It's amazing what those animals can do when they put their minds to it. My goats have been having some serious boundary issues lately. Dang goats. Dang fences. Those horses are beautiful! Surprisingly, mine has never tried to escape! Aw, Zip and Zim are both beautiful horses! My step-MIL was a huge horse fan, and they boarded a horse for several year out on their back pasture. The town has been rezoned since then though. Horses are no longer allowed and her barn has been turned into a florist workshop. Beautiful horses both of them. And I think animals are a lot smarter then we think or give them credit for! A lovely post to read... beautiful animals to see. Fortunately I have not had to deal with an escape artist in quite some time. They can be a handful.